This might be an unreasonable expectation, but perhaps it matches with Anker’s target market. 3 USB to lighting retractables. This week I’m replacing the 2 USB Micro and one lighting for 2 Retractable multi connector (lighting + micro + USB C) that extend to more than 3 feet and look like they will last for years. Subpar quality retractables are trash but the decent quality ones that I have are some of my most appreciated mobility hacks. 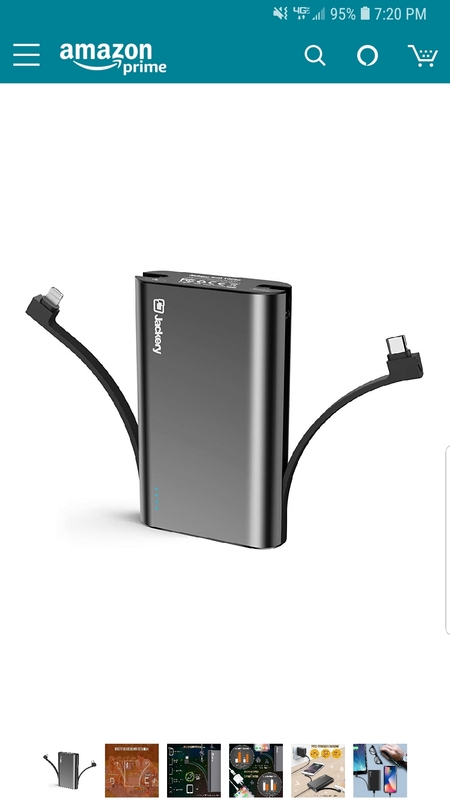 Battery pack like PowerCore 10000 or PowerCore Speed 20000 with attached all in one cable which has attachments for Lightening ( at least 2), USB-C, Micro USB. Whenever on family vacation there are times when we forget chargers or charging cables, this will greatly help. I had this incident at my recwn5 vacation when I forgot my Samsung USB-C charging cable and unable to use my phone. Anker can keep micro usb port for charging the battery pack and provide a micro usb cable as well. That way anker will cover all 3 port types. The customer will just carry battery pack and plug. Second idea is enhance powercore fusion plug with a retractable cord that has 3 attachments similar to powerline 3 in 1 cable (lightening,usb-c, micro usb) with usb 3.0 on the other end. This will kill all the competitors. You have a valid point about the failure but i think bulkiness can be definitely addressed by designers. I have both jackery bolt and anker powercore. Both of them are not bulky and are not very different in size and capacity. Utility wise jackery has taken it to the next level although i still love anker but i see an opportunity for anker. I think the idea is cool, but I also worry about that If the cable is damaged, this may increase our product replacement rate. I can understand. Then how about something like techlink recharge where the cable sits in a slot around the battery pack. Agreed. The techlink type does not have a built in cable rather it just provides a slot to fit the cable snug around the battery pack. I would love to have Powerline or other network components from anker . And I wish the Anker glass guard back again!! There would be a huge market for a cordless Alexa device of any size. People frequently ask for one on the Echo question pages. And it looks like Amazon may be discontinuing the Tap, which is the closest Amazon came to a hands-free, battery-powered Alexa speaker. Last year, Anker announced Zolo Halo+ (Amazon Alexa) and Zolo Mojo+ (Google Assistant), which were both wireless smart speakers. Unlike Model Zero, it appears as though these products are not being transitioned over to Soundcore, but rather cancelled altogether. However, there are signs that a Soundcore Flare S+ is coming soon. We’ll know more at the end of the month, but my gut tells me it’s a wireless smart speaker that will retail for about $150. Model Zero uses Google Assistant, so it will be interesting to see which AI Soundcore opts to use in the Flare S+. Again, this is all only if my speculation is correct. For now, we’ll just have to wait and see. Either way, I agree with you in that Anker should come out with a wireless smart speaker. I'm really curious about the Flare S+ as we've heard nothing about it except that info you found on an upcoming trade show! I've been so impressed with my Flares that I can't wait to see what Soundcore's coming up with next. And I'm so tied into Alexa that a cordless smart speaker that works with Google or Siri just hold no interest for me. It's got to be Alexa (fingers crossed). I had thought there might be a possibility in the Eufy family after the Genie, but Anker may prefer to produce it in the Soundcore line. I completely missed the whole Zolo line. Sometimes fragmentation keeps a company from reaching everyone they could. I agree about Alexa. You can already activate Siri/Google Assistant on most speakers when they’re connected to your phone, though I’m not sure about hands free. I've become so spoiled by Alexa, it's almost sad. I can't be the only one who has called out "Alexa" in a place where there is definitely no device that could respond just because it's now so ingrained in my routine. I'd love to see a tech backpack with a slot for a universal anker battery pack and an external USB port. With how good their portable battery packs I'm actually surprised they haven't created a USB/AC home speaker. Desk mic would also be pretty useful as well. Just 3 things I use on a daily basis but wished they were Anker made as you get solid build quality at a very reasonable price. lets talk about battery packs . What is the perfect battery pack for me? I really want to see one with like 65W USB-C Output, pass thru charging, integrated QI charging on the top and I didnt mind few USB QC 3.0/IQ charging ports and nice hardcase for transport with enough space to store the cables. The 65W USB-C power output will handle laptops like ThinkPad Carbon X1 that has rapid charge. If this powerbank can be fast charged with USB-C for a few hours it will be even better. So guys share your thoughts please. @AnkerOfficial what do you think ? Car phone holder with integrated wireless charging and active ventilation ! I have something like that and it works but when the day is sunny (almost every day here), wireless charging heats very fast my phone and the charging stops. I cant find a phone holder that has integrated wireless charging and fan for active ventilation of the back of the phone during use. So maybe @AnkerOfficial can do something about it ?